It has indeed been a while since the last post. Your Microburin has still been dogged by bouts of ill-health and while the mind is largely mended, the meds have caused trouble with a stressed immune system. However, onward and upwards. The time since last posting has not been short of media coverage of the Mesolithic. The most recent headline is the publication, as two volumes, of the most recent (and rescue) fieldwork and research at Star Carr. The reports are open-access free-to-download, or to purchase for just under £100. This is a remarkable achievement and congratulations go to Nicky Milner and the entire multi-disciplinary project team (including Dr Harry R on fungi). Warm celebration surrounds now-Dr Charlotte Rowley, University of York, one of Star Carr’s lithics gurus, viva voce. Exciting work continues offshore in mapping and investigating Doggerland and, for an example of best practices in community archaeology, the Mesolithic Deeside Project (Aberdenshire, Scotland). 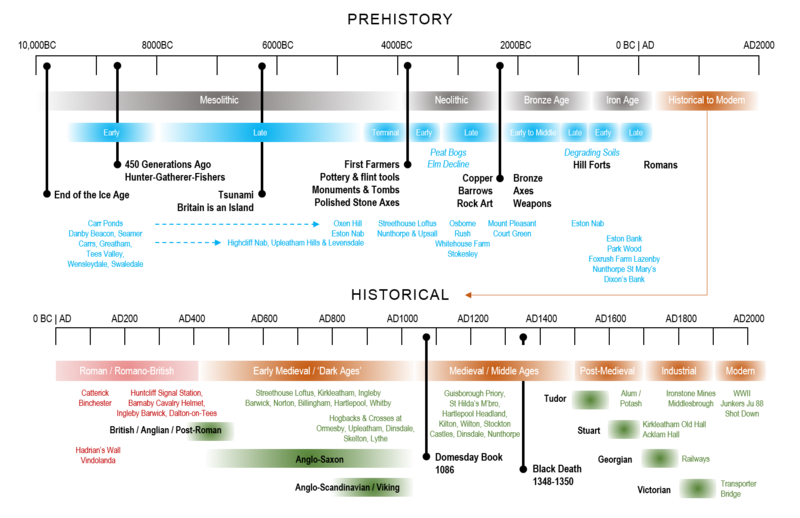 There have also been influential, if not game-changing, reports about DNA and isotope research findings related to the Mesolithic period, earlier hominin periods too, transitions to the Neolithic, and later prehistory such as the Beaker period – adding insights that we could not have imagined until very recently. Science wins. 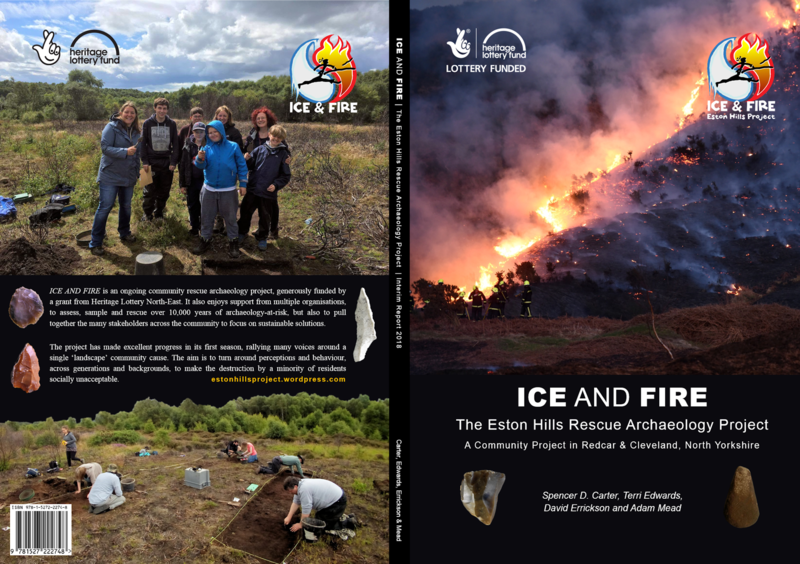 Speaking of ice, and fire as the arson season commences on Teesside, there’s been a great deal of progress with the ICE AND FIRE rescue archaeology project in the Eston Hills, Redcar & Cleveland, North Yorkshire. The 2017 season finds have been catalogued and some enigmatic, unusual artefacts will undergo further scientific research. The HLF-funded project in 2017, its first full season of geophysical surveys, test-pit excavations and pollen-coring, has exceeded all expectations. 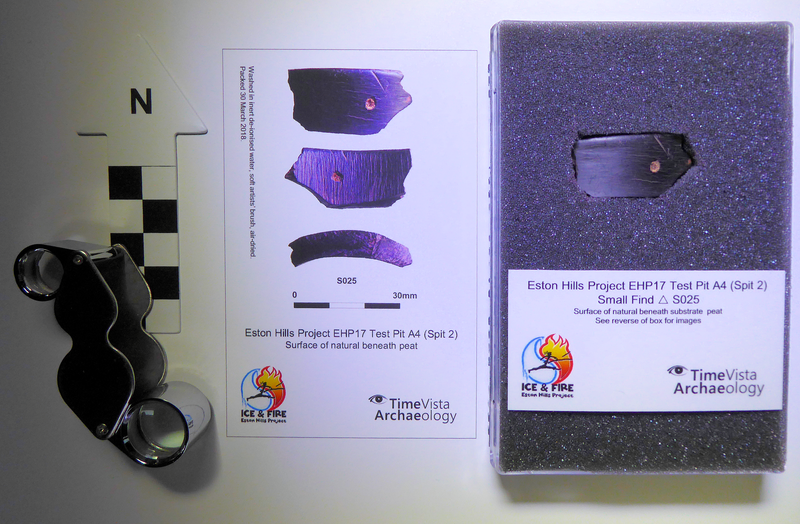 Features include three hearths or fire-pits, a posthole with a potsherd in the fill, many flint artefacts and a radiocarbon date from the edge of our wetland – the edge and not yet the centre – dates back at least to the Bronze Age! We hope that cores from the centre of the wetland will take our narrative back to the end of the last Ice Age. There is still the prospect that it may preserve organic material such as wood, antler and bone (if anaerobic) given that we have intense human activity directly around it, from the Early Mesolithic to the Iron Age, with particularly strong Neolithic signatures. We have now published the free-to-download 2018 Interim Report, lavishly illustrated, which places the project and our findings so far into a regional perspective. What’s more, we have LiDAR and Google Earth images for what looks to be a previously unrecorded prehistoric monument, or indeed monuments aplenty, close to the Eston Hills. 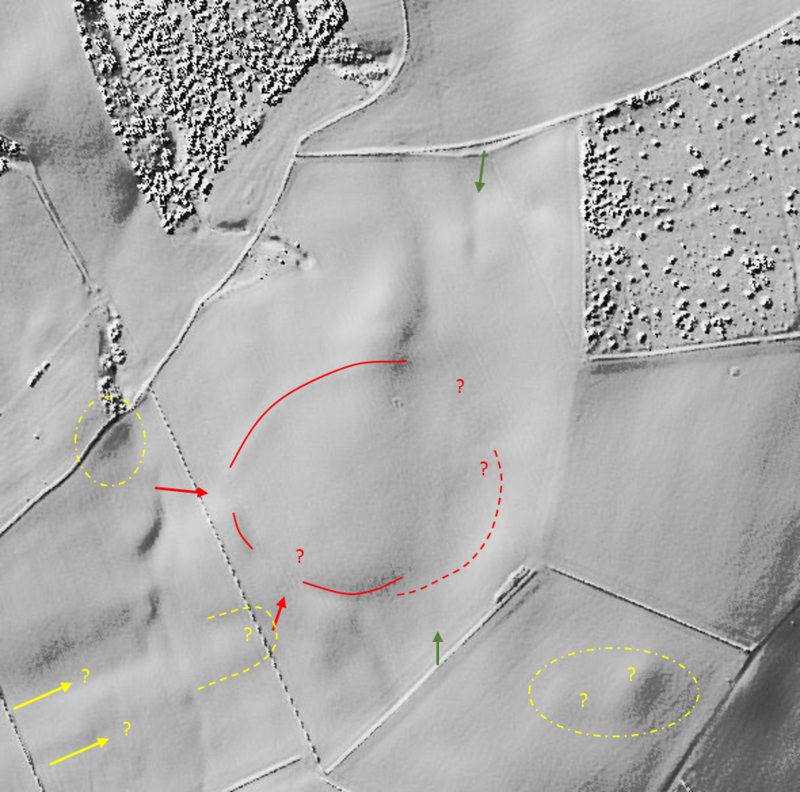 Image | Environment Agency LiDAR laser-imaging has revealed a large circular feature, more than 100m diameter and, in addition to a couple of scheduled round barrows, a possible linear feature too (yellow). They show as soil and crop marks in both winter and summer on arable land. In addition to the report, we’re pleased to announce that printed A3-size posters will be available for distribution by the end of April. The project team will deliver copies to schools, colleges, museums, libraries and other community outlets. It is worth emphasising that we do still have a few libraries and museums open – celebrate the third sector of community volunteers where professional staff have been made redundant. We have also added this and a Timeline Chart to our Publications webpage. The chart is included in the report. 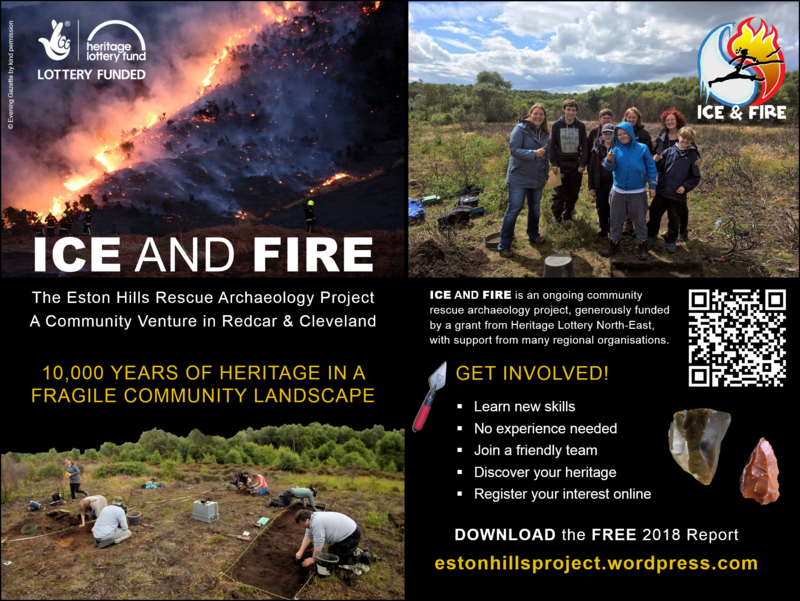 We’re seeking charitable funding (£2000) from regional and national archaeological and historical societies, as well as commercial businesses in Redcar & Cleveland (Teesside, North-East England), to print and distribute our 2018 report across the community. Regrettably, and despite huge progress across local government, emergency services and community agencies, the 2018 fire-season has commenced together with other antisocial behaviour, illegal offroaders and more. We need our message about what is at risk – in addition to human lives – to go viral. A remarkable fragment of oil-shale or cannel coal, much like Whitby jet, from one of our 2017 excavated test pits. It is most likely prehistoric possibly early Bronze Age Beaker period (c. 2000 BC), or Iron Age to Roman-British. Whether the rim of a vessel, or an arm band or bracelet, around 90mm diameter, it is extremely rare. Only one other such vessel is known in Britain (Devon) and if an armband, it is of a very unusual form. The inner surface has been carefully shaped, more than likely with a flint blade. The hole is drilled either for repair or suspension. This would seem to have been a highly valued item or heirloom. Its next stop will be the National Museum of Scotland for examination by leading experts in this material and artefact type. We would like to create a museum display of the amazing 2017 finds, as well as hands-on displays for schools with replica, artisan-crafted pottery, flint tools and prehistoric bronze artefacts such as daggers, axes and arrows. Conversations are underway. 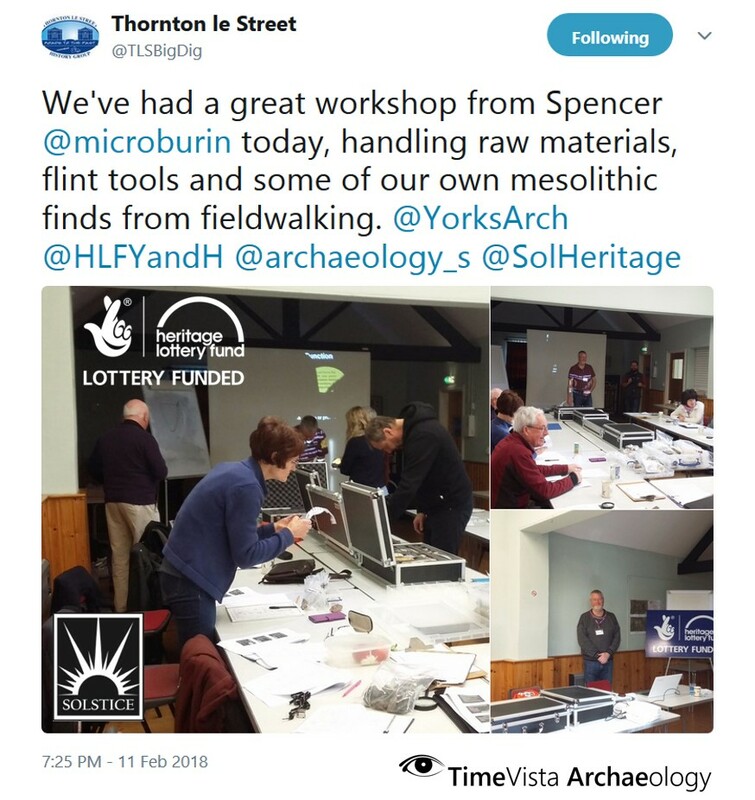 Earlier in the year Microburin was delighted to attend the Thornton-le-Street Roads To The Past kickoff weekend in North Yorkshire, hosted by friends at Solstice Heritage LLP, to examine their lithics finds and provide an introduction to prehistoric lithics workshop – with the luxury of home-made cakes. What’s remarkable is that on day one of their field-walking they recovered a fantastic flint-and-chert assemblage that takes us back to the Mesolithic, as well as later periods. In May I’ll be returning to deliver two more workshops to enable the community group to be self-sufficient in first level recording and identification of their finds. There assuredly is much more to come in those river-side fields! The hint is always in wetlands. Lastly for now, and sadly much delayed, I am completing a lithics chapter for the Street House Farm Project 2010-11 season with, yet again, a rich suite of flints that demonstrate thousands of years of persistence in a very special place. In the last two years we now have a series of phased Early Neolithic (around 3700 BC or earlier) domestic structures with all the material culture to match. Radiocarbon-dated hazelnuts rule! 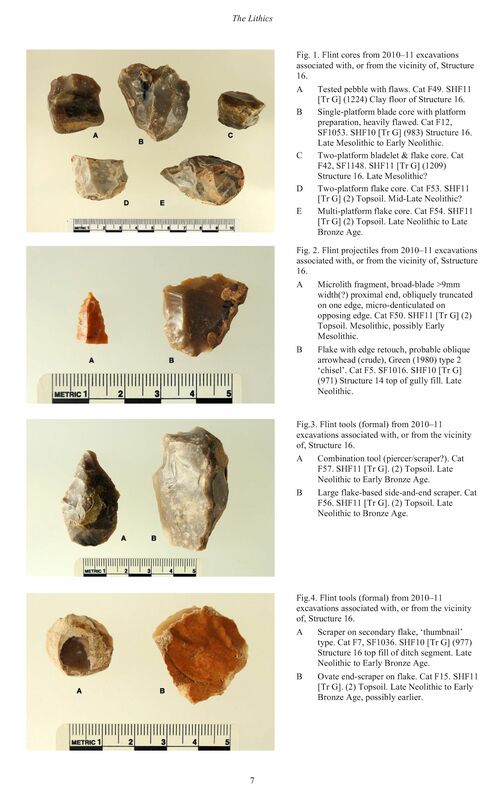 This entry was posted in British archaeology, Events and activities, Hunter-gatherer-fisher, Lithic analysis, Mesolithic, Microburin miscellaneous, Sites and finds, Teesside archaeology by Spencer Carter. Bookmark the permalink.